Our parents are aging, and we are all worried about how we will care for them in their infirmity. For me, my mother especially has been the center of my universe, and the most giving and strongest woman I know. I love my mother dearly and always hoped I would be around her as she aged. My mom is a fiercely independent woman – diametrically opposite to the parent’s character portrayed by the yesteryear’s angry young man – Amitabh Bachchan. The movie Piku depicts the warm yet loud relationship shared by Piku and her aging father Bhaskor Banerjee (Bachchan). Piku is portrayed as a strong, successful, stunning, sexually and financially independent woman – Deepika Padukone. Banerjee, similar to many progressive Bengali men I have met, takes pride in his daughter’s independence and insists she marry for purpose, and not to merely serve a man. Piku and Banerjee get along barely with frustrations hurled at each other daily – just like any other parent child duo. But Piku’s dedication to her father’s wellbeing is something I aspire for. For what’s it’s worth, the Eastern traditions place a significant emphasis on taking care of parents and grandparents to ensure the family unit is tightly-knit. Piku, delivers a modern version of the traditional Eastern world values and highlights a modern woman’s dilemmas when caring for aging parents – managing dates, work, social and personal engagements. 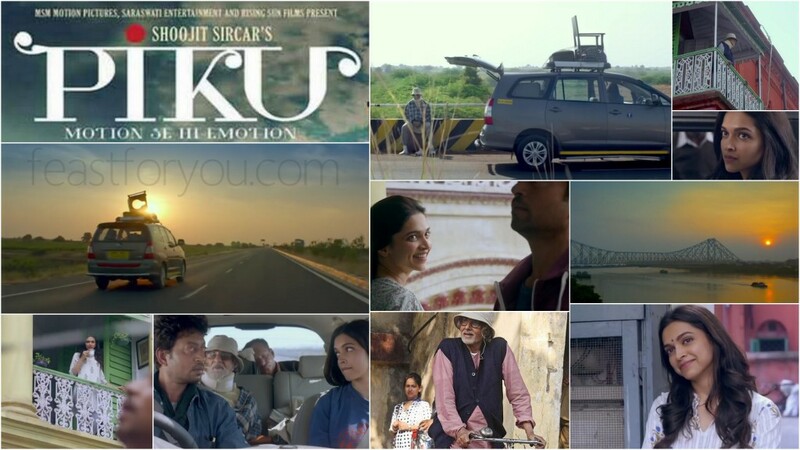 Piku endears further with the introduction of Irrfan Khan in a romantic lead. I was surprised at myself calling Irrfan Khan one of the sexiest man in showbiz. His scruffy, direct style and drunken eyes did the magic! All characters in the movie are cast well including Amitabh Bachchan, who plays are perfectly eccentric old man who is direct, mostly rude and needy! Moushami Chatterjee is as gorgeous as ever and effervescent as Piku’s maternal aunt. She is seen constantly bickering with Amitabh during the course of the movie, reminding us of our own family drama. Deepika Padukone is a surprise package in Piku. She more gorgeous today than when she was introduced to Bollywood 8 years ago. Unlike her contemporaries, Deepika continues to experiment with meaty roles and shines in this movie too. She’s subtle when morose, and loud when upset! She’s fiery and it’s easy to connect with her value system. Kolkata, one of my favorite cities in the world is charming when the sun rises over the Howrah Bridge or setting over the Ganges. In the recent years, young directors with roots from West Bengal have made a mark in Bollywood. Soojit Sircar (Vicky Donor, Madras Cafe), Soojay Ghosh (Kahaani, Bang Bang) Anurag Basu (Barfi, Life in a Metro, Gangster), and the legendary Ritupurno Ghosh. Bengali directors have directed and produced some landmark cinematic pieces through history, and I sure hope the successful trend continues. Rather than adapting to the usual Bollywood song-and-dance style, Bengali directors highlight subtle background scores, Darjeeling’s enchanting streets, and Kolkata’s street food – perfectly blended in serious cinematic undertones.